TO BE A PART OF THE FUN! Are You Ready to Become a Knucklehead? 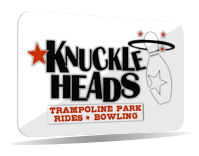 Knuckleheads Trampoline Park ★ Rides ★ Bowling is open year-round and is designed to provide family fun: rain, shine or snow. Knuckleheads features: a full bar and menu, a Trampoline Park, an exciting 10 lane bowling center, family thrill rides, go-karts, an awesome arcade, 4 story children’s play area and much more. It’s a favorite for indoor fun in the Dells – and you can be a part of it! At Knuckleheads we love to promote from within, start as a ride operator and who knows what the future may bring! Possesses a great work ethic – always willing to pitch in to get the job done! Join the Fun – Be a Knucklehead! The time is now – Go ahead…apply! Apply here to be part of the fun! Applications are also available on-site. Visit our front desk at Knuckleheads located at: 150 Gasser Road between Outlets at the Dells & Great Wolf Lodge. Find and compare hotel rates is Wisconsin Dells via HotelsCombined​.